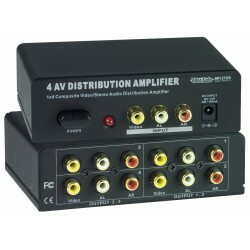 Enables four composite video displays and speakers to be driven by a single composite video device with stereo audio. The Composite Video + Audio Splitter enables numerous (up to four) displays and speakers to be driven by a single composite video device with stereo audio. The same image is displayed on all outputs with no degradation, and the same audio is sent to all speakers. 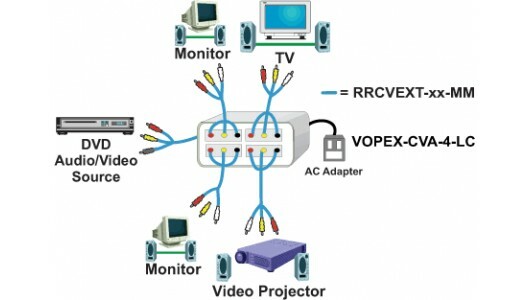 Extend enjoyment of your A/V equipment to numerous additional rooms, up to 160 feet away. 120 VAC at 60 Hz via AC Adapter. Four RCA composite video jacks. One set (R and L) of RCA audio jacks. Four sets (R and L) of RCA audio jacks. 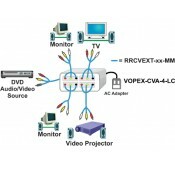 6-foot RCA audio and composite video combination cable.